Successfully Added Long Range Tactical Green Laser Gun Sight for Rifles (Weaver Rail Mount, Dual Switch) to your Shopping Cart. When you can’t have a second shot, you make the first one accurate with our Tactical Green Laser Gun Sight. Made of rugged aluminum and painted in glossy black color, this gun sight has been designed to be resistant, durable and fit most long range rifle weapons through a weaver rail mount. Just fix the device right on and the green laser will guide your bullets to its target up to 500 meters away during day and a super long 1500 meters away at night. Turning the laser on and off is easy too thanks to the tail line switch and constant switch, so you can instantly go from hunting to hidden. Finally, this beautiful precision gadget also comes with two adjustment knobs for you optimize and adjust the laser beam to your every need. But why a green laser sight? Scientific studies show that our eyes see green better than any other color, in any lighting conditions. For the same amount of light output, green looks brighter to our eyes. Green laser sights are technically advantageous to red laser sights. 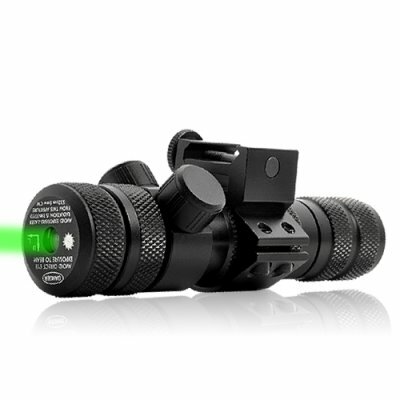 So whether you are considering using laser sight for the first time, or thinking about upgrading your existing laser sight, this Tactical Green Laser Gun Sight is your ideal choice. Whether you are Law Enforcement professionals, hunters, or civilians protecting your home and family, you can equip your rifle with this little accessory to provide you with extra confidence and accuracy to make that one critical shot. Also suitable for reselling on your online store to make some extra profits. Order yours today and it will get shipped tomorrow. From your reliable source for cool electronic gadgets, Chinavasion. Handheld lasers can be hazardous when mis-used. They should only be used responsibly by adults and never pointed at people, animals, or transport. LASER ADVISORY Please additionally note that many countries have import restrictions on laser products - please check your destination rules before committing to orders. While it’s recommended to use with rifles, this laser sight can also be used on other weapon that have a weaver rail mount. If you are looking for a gun sight specifically for lighter weapons (pistols, revolvers, etc), please check out our CVKW-G336.